A couple of years ago, I wrote about batch testing ammunition with Lapua at Bisley, UK. Well, the rounds that I purchased following the testing at the Lord Roberts Centre finally dried up. Living just 15 miles away from Eley‘s Headquarters in the UK, I thought it would be the opportune moment to try out their test facility and batch test Eley’s ammunition in my rifle to find out which one would be better suited. Eley’s Tenex or Lapua’s Centre-X (The best performing round in my rifle previously). I contacted Eley and booked in to batch test my rifle, I also asked if I could document the procedure to de-mystify the process to people on the internet. I was granted permission to record and after time annotating and editing the footage I have produced a 5 part video blog on youtube. 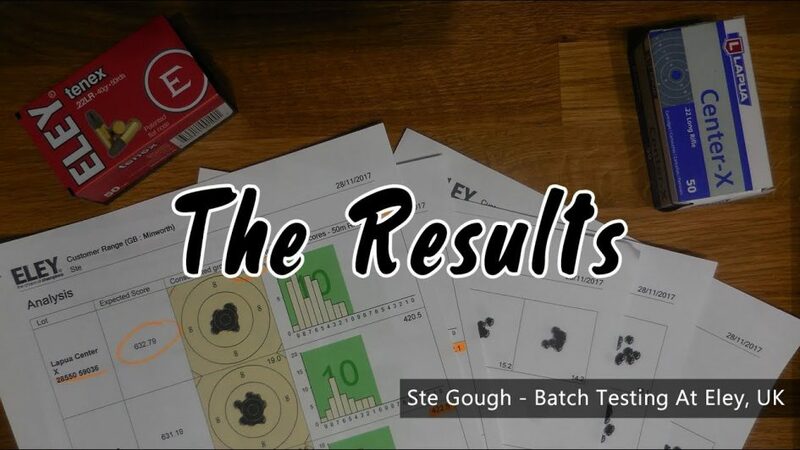 These videos show the process of Batch Testing .22lr Ammunition at Eley’s Customer Test Centre in Minworth, UK. Thanks to Martyn Buttery, the Customer Test Range manager for taking me through the process and letting me put a camera in his face for most of the day whilst he set my rifle up for Batch Testing .22lr Ammunition. I hope you find these videos informative and interesting. If you did, subscribe to my channel and give the videos a like. The cleaning (or lack there of) was quite embarressing, but I felt it pertinent to keep in the video so hopefully others can learn too! haha. Did you get any feedback red why they take the barrel out of the stock? Given that you will be shooting with a stock surely the harmonics involved would be different in a stock vs out of one. Therefore getting the best result in your stock may be the best testing option. I would suspect that given the variances in stresses that screwing in your stock can create, ELEY take the rifle out of the stock to give the action the best possible shot at ammunition testing without these variables. The harmonics of the barrel are the ones that count, and your stock should be free floating to avoid any interference from the stock. I have not had the official line back from ELEY as to why they test this way, but there are many reasons that I can think of off the top of my head. Not least that if you change stock, would you then need to change ammunition? But the chamber and barrel (the parts that come into contact with the bullet) have not changed.